For many of us, St. Patrick’s Day is one of the most enjoyable celebrations of the year. To go with your Guinness beer and Shepard’s pie, we have put together list of Irish-related films that you can check out on March 17 (or any other date). While there are many great Irish-themed movies, we’ve elected to focus on one thing—fun. That means that this slate of films is full of laughter, music and romance (and even a little silliness) so enjoy. Please know that most of the films listed below are available to rent on common streaming services, such as iTunes and Amazon Prime. We have also noted if the film is available via a streaming service, such as Netlix. On a small island off Ireland, Ned Devine wins a fortune in the Irish Lottery. The only problem is that Ned Devine died upon hearing of his win. With no heirs, that means that the entire island—in order to keep the money—must work together to convince the Lottery Board that Ned is still among the living. “Waking Ned Devine” is a charming and winningly fun film highlighted by the veteran cast, in particular Ian Bannen and David Kelly as Devine’s old friends who orchestrate the elaborate charade. Sweet and simple film about a street musician and a Czech immigrant who fall in love in Dublin—their feelings revealed through the songs they compose together. The movie’s plot is rather slight, but the music and atmosphere is off the charts charming—primarily because of the honest performances by leads Glen Hansard and Markéta Irglová. The duo won an Oscar for best song (“Falling Slowly”) and the film would spawn an awarding-winning Broadway musical. Whimsical film starring Tom Cruise and Nicole Kidman as an Irish couple from very different backgrounds who come to the United States to find a future. Directed by Ron Howard, “Far and Away” is a gorgeous film—perfect for anyone looking for an old-fashioned romantic melodrama. Rollicking musical about a young man who organizes a R&B band in Dublin. The film is often crude, but the ’60s-inspired soul music is electrifying. Watch for a young Glen Hansard (who stars in “Once”) as the guitar player. A Hollywood classic. American John Wayne arrives in picturesque Ireland and woes the fiery Maureen O’Hara. 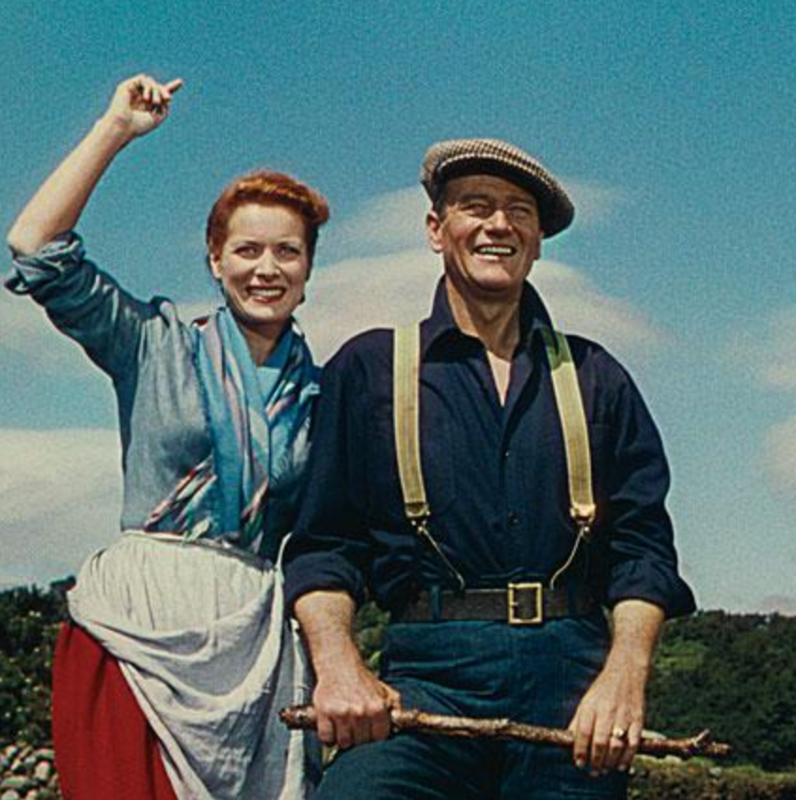 “The Quiet Man” delivers a beautiful, romanticized look at Ireland that only exists in the movies. Still, it is one of greatest films Hollywood has ever produced about the Emerald Isle—highlighted by winning performances by Wayne and O’Hara. It also features one of the greatest fist fights in film history. “The Quiet Man” would be nominated for eight Academy Awards and win two, including for Best Director (John Ford). Don Cheadle is an American FBI agent who comes to Ireland to bust a drug dealer with the help of a seemingly dim-witted local cop. “The Guard” is caustic and sharp—and wickedly funny. The movie is highlighted by the performance of Brendan Gleeson as the Irish police officer who is not as dumb as he appears. Exuberant film about a 14-year-old boy who starts a band to impress a girl. “Sing Street” is a blast—more joyous than “Once” but not a crude as “The Commitments.” While the low budget of the film shows at times, the film soars due to the wonderful music and winning cast. Enjoy spending your entire St. Patrick’s Day watching some of cheesiest horror films ever made. Twenty-five years ago “Leprechaun” was unleashed on the world. The movie—about an evil Leprechaun who goes on a rampage looking for his stolen gold—was a mishmash of bad effects, forced humor, a weak plot and a pre-“Friends” Jennifer Aniston. Still, the cheese factor was deep and a sequel followed. Then another. Then another. And another. Twenty-five years later there are seven “Leprechaun” movies—the franchise achieving a “Sharknado” level of notoriety. Most of the films star veteran actor Warwick Davis as the evil Leprechaun. So, if silly horror films are your bag, SyFy has an entire day devoted just to you.